Do I have to say anything at all? A bit like with Snakes on a Plane, the title alone pretty much guaranteed I'd watch this, but once I saw the poster I knew I had to own it. Can you guess what the plot is? There's some unit of the Japanese Defence Force (what they're forced to call their army since they were the runners-up in WWII) that's out doing some military stuff and then some experimental equipment causes them to go back in time to samurai days. There's two warring samurai clans and the modern soldiers are caught right in the middle of them. And then they resolve their problems through the art of violence. Yay! This is actually a remake of an old 1979 Sonny Chiba film called GI Samurai or Time Slip(well, in the West anyway). Actually I think technically it's a sequel, but that doesn't matter. Okay, so the original is pretty much the same story but with less sophisticated effects, but it has a certain lazy charm that entertains. There are lots of fun mistakes too like the time travel process stopping wristwatches, but leaving tanks fully functional. It's also got a surprisingly high score on iMDb. Samurai Commando Mission 1549 isn't exactly a film that will challenge your intellect, but it's fantastically silly fun and there's nothing wrong with that. And seeing as it's in foreign, that makes it all the more culturally valid. I'm actually massively disappointed that they didn't get Sonny Chiba to do this film. He'd have been great as the samurai warlord. But I guess you can't have everything. The acting is better than you'd expect from a film like this, especially in the second half of the film when emotions start to run high. The fight scenes are visually engaging despite somehow being unspectacular. Yeah, it's a solid enough film and way better than it has any right to be. You don't have to be drunk to enjoy Samurai Commando Mission 1549, but I do recommend that you've at least taken some of those drugs that are so popular with the kids these days. The acting isn't bad, the plot isn't terrible, but it is a bit lacking, especially when you compare it to the original. If you haven't seen the Sonny Chiba version, then you'll probably enjoy this just fine. If you have seen it, then you might be unhappy with this one as it's somehow just not as good. All the elements are there and there's nothing wrong with it, but it just doesn't surpass itself in the way that the 1979 flick did. Back in the day, my friends and I came up with a system to rate bad films that were worth watching. Anything that scores more than 3 out of 10 pretty much guarantees a fun film. Some of the items on the list seem unlikely, but you just have to start looking for backlit fans to realise how prevalent they are in the less cultural end of film-making. 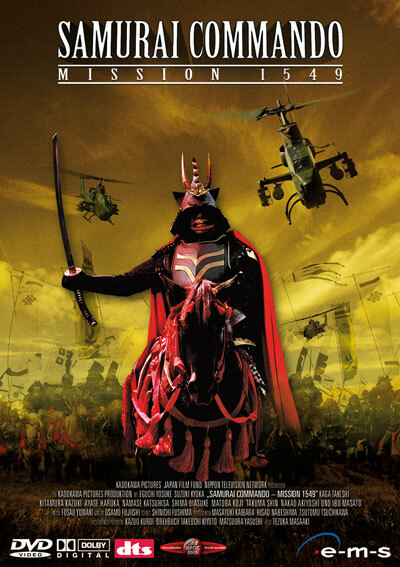 So 4 out of 10 for Samurai Commando Mission 1549 makes it very much worth watching.